Stone finish, veranda & natural vines compliment the front of this terrific 2 storey home, offering nearly 1300 sq ft of living space. Nestled in a quiet area of Hampton Village, close to public transit & Claypool Drive, 407 Klassen Lane provides easy city access to all amenities. The main level boasts a modern décor with open layout, & rich tone hardwood floors. The kitchen with separate dining area features a large island with BI dishwasher & under mount sinks. All stainless steel appliances are included. Gorgeous granite draws the eye and compliments every counter in the home including the kitchen, main floor 2pc bathroom and upper level 4pc bathroom. The 11 x 14 ft master bedroom offers a walk in closet and direct access to the bathroom.2 additional nice sized bedrooms complete the upper level. The basement includes roughed in plumbing for another bathroom if desired and is open for development with exterior walls already insulated and drywalled. Front load washer & dryer are also included. Central air conditioning is a “must have” feature, along with a fully fenced & landscaped back yard, underground sprinklers, a deck for barbequing & a brick pergola for summer entertaining. 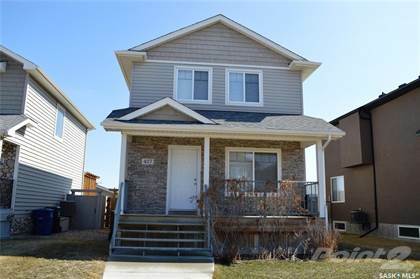 To complete this package, there is an insulated double detached garage, conveniently accessible from a paved back lane. With summer nearly here, this terrific package is undeniably a great place to call home! Call your agent or the listing agent today, to view. Hi, I'd like to find out more information about 407 Klassen LANE. Thanks so much!